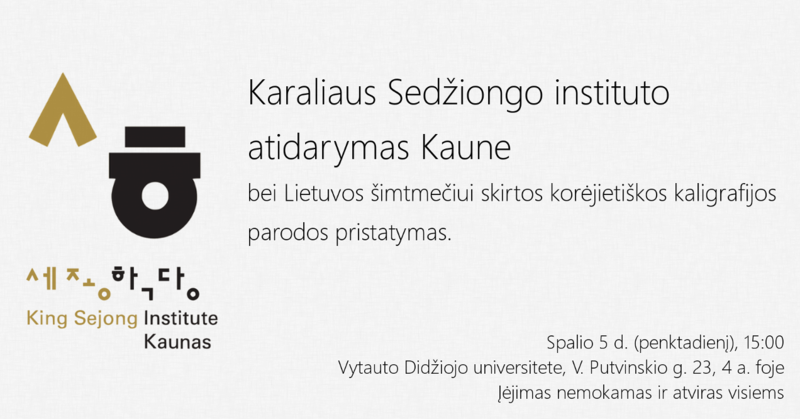 On October 5 we invite everyone to the official opening ceremony of King Sejong Institute (KSI) in Kaunas at Vytautas Magnus University. The event will start at 15:00 and take place at the 4th floor gallery of V. Putvinskio str. 23 building. After opening greetings, we will invite everyone to see Korean calligraphy exhibition, which is organized in cooperation with Korean community in Lithuania, and enjoy some light snacks. KSI Kaunas is marking one more step taken by VMU to strengthen mutual understanding and cooperation between East Asia region and Lithuania. Korean studies were started here already 11 years ago, making VMU the first such institution in Lithuania and the Baltic states. At that time students could choose Korean language courses, while latter classes on traditional and contemporary Korean culture and society were integrated in existing East Asian studies programs. VMU is also constantly expanding cooperation with Korean universities (at the moment there are 12 such agreements) and offers students possibility to visit South Korea via exchange studies. The opening of KSI Kaunas is strengthening all these achievements and offers new opportunities to all to learn more about Korea. KSI Kaunas is already conducting Korean language courses and workshops. In the near future it will offer lectures on Korean culture and many other events that will bring Lithuania and Korea closer. The establishment of KSI will also allow VMU to invite Korean language and culture teachers from South Korea and provide new opportunities to most active students. The network of King Sejong Institutes was initiated by South Korea’s government in 2005. The goal of this initiative is to create Korean language and culture hubs that provide opportunity to anyone curious about Korea to learn more about this country. Currently, there are 174 Institutes in 57 different countries.